If you have a mobile device that supports Bluetooth® Low Energy, download the nRF Connect app from Google Play or App Store to test your application. The following procedure assumes that you have programmed the ble_app_uart example from the nRF5 SDK. Steps for testing other examples are similar. See the testing instructions for each example in the nRF5 SDK documentation for more information. Download and install nRF Connect from Google Play or App Store. Make sure that the DK (Development Kit) is running the ble_app_uart example. LED1 should be blinking every 2 seconds, indicating that it is advertising. Find the device and tap Connect. The default device name for the ble_app_uart example is "Nordic_UART". 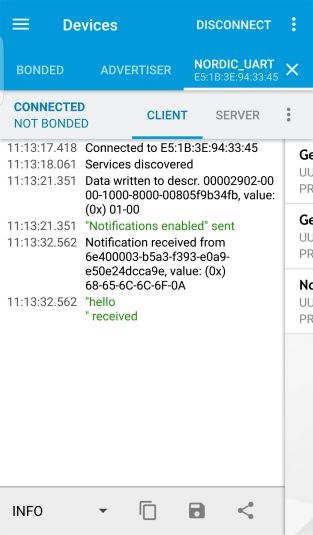 When connected, tap the options button below the device name and select Enable services. 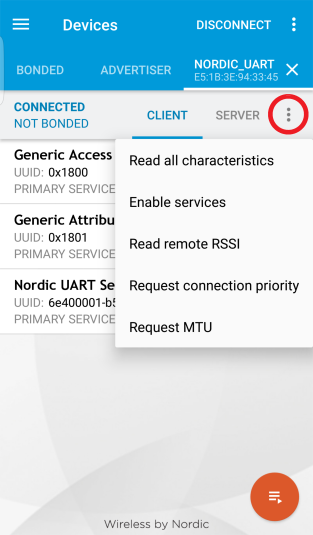 This example communicates over Bluetooth Low Energy using the Nordic UART Service (NUS). Tap the options button and select Show log. In a terminal connected via CDC-UART, enter hello and send it to the DK.